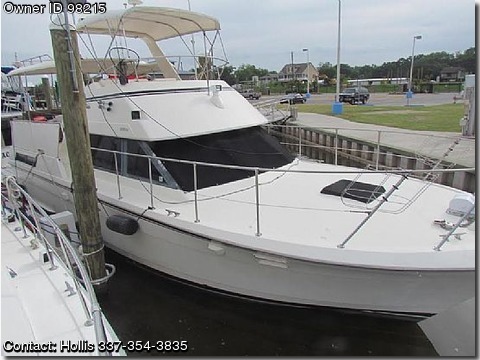 Boat is located in Delcambre,Louisiana.Please contact the owner directly @ 337-354-three eight three five…Hazel &amp; Hollis has maintenance records back to 1997. In October 2012 she had over $14,000 of work done, which included a bottom job. 6/1/14 she had her AC serviced and is working great. She was always a well-kept boat. This Hatteras Double Cabin offers a comfortable well thought out floor plan complemented by teak and ash joinery. Both heads have separate showers. Hatteras earned high marks with this design for classic styling and construction. She has an optional aft deck hard top, radar arch, twin Caterpillar diesel 3208 engines with relatively low hours (under 1600), and extensive spare parts (includes spare shafts). She is clean, ready to go and priced to sell. She would be a great boat for the inter coastal. She is being sold because; &quot;We don&#39;t use her that much&quot;.